This image shows large pulmonary vein inflammation in wild-type mice (left) compared to knockout mice (right) lacking the αT-catenin gene. Learning how a cardiac protein found in pulmonary veins contributes to the development of asthma may help scientists understand why some asthma is resistant to typical steroid treatments. 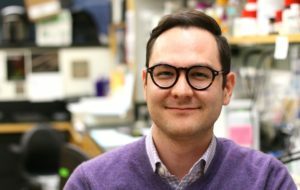 In a new study published in the Journal of Allergy and Clinical Immunology, Sai Folmsbee, an MD/PhD student and first author of the paper, showed that the cardiac protein αT-catenin is necessary for the development of asthma. “Now that we know the pulmonary veins are important to the airways and the development of asthma, we may be able to develop future therapies that can target the veins specifically,” Folmsbee said. Previous genetic studies had shown that the gene for this protein was associated with the development of steroid-resistant asthma but it was unclear how or why it was resistant. In the lung, αT-catenin, an important mediator of cell-cell adhesion, is found in cardiac cells surrounding the pulmonary veins but how it contributed to atopic asthma remained unknown. Sai Folmsbee, an MD/PhD student and first author of the paper, showed that the cardiac protein αT-catenin is necessary for the development of asthma. The scientists performed experiments using genetic knockout mice lacking the αT-catenin gene and compared their responses to different tests to the responses of asthmatic models. Folmsbee observed that the loss of the αT-catenin gene protected the mice from developing asthma. These mice had less inflammation around their pulmonary veins and less goblet cells, or mucous producing cells, surrounding airways near pulmonary veins. “It is still unclear how this cardiac protein could be directly affecting inflammation and inflammatory cellular makeup of the airways, so we are hoping with future work we can figure out how exactly these cardiac cells could alter signaling or cellular migration,” he said. As a student in the Medical Scientist Training Program, Folmsbee will start clinical rotations in the next few months and looks forward to how he will be able to apply the knowledge he has learned in the lab to the clinic. The research was funded by National Institutes of Health grants T32CA09560 F30 ES024622 and GM076561 and an American Heart Association pre-doctoral fellowship 15PRE21850010.